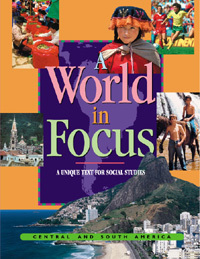 Before beginning a study of Central and South America, ask your students to bring in an object, news article, photo, or other artifact that illustrates something they already know about the region. Has anyone visited or lived in one of the countries of Central or South America? Maybe they are familiar with the languages, music, arts and crafts of Central and South America. Have they read about a rain forest or seen it on TV? Do they know about the animal and plant life? What do they know of the area's history? Any of these can open the door to further study. Based on your discussion and artifact display, jot a class list on chart paper of your students' previous knowledge. During your study, have them refer to the list periodically to see if any of the information changes, or if they are able to add more depth to it.